Article by Fionnbarr O'Luain ©. Posted in the Magazine (Tell Your Own Story: Tell Your Own Story, Writing & Me). My book is set in the turbulent years of the early twentieth century. The story is initially set in a small East Coast community – the fictional seaport of Brayspoint. A story of star crossed lovers, the book seeks to acknowledge the story of the North’s two traditions. Sean Maloney will join the IRA. Robert McBride will join the British army. The reader journeys with Sean to Dublin in April of 1916 – then in July with Robert to the Somme. The book follows the fortunes of its characters as the storyline moves through the Anglo Irish and civil wars. The novel explores the effect of violence upon the Irish people – divisive – dehumanising. The reader is also taken not just to the British trenches but to the German frontline also. A reminder that other Europeans suffered too. Poignant at this time of Brexit, centenaries and thoughts of avoiding conflict. The book was some time in the ‘melting pot’. The desire to write at all came from years of experiencing conflict. Warrenpoint was subject to bombs and incendiary attacks on its hotels. A gun battle raged across Carlingford Lough at the narrows – sometime before the 1979 bomb. Life in Belfast as a student also brought its experience of violence – sometimes too close. Actions which affected friends ultimately affected oneself. So down to writing. A period of unemployment helped. Or at least part time employment. Advice – there seemed plenty of it. Author’s guides -Writing for Pleasure and for Profit ( M. Legat ). Advice from famous authors. One stood out. The American evangelical writer Norman Vincent Peale ( Mr Positive Thinking ) gave the most simplistic advice of all about getting started. Get yourself some paper , some pencils and some pencil sharpeners and get going. Strunk and White’s elements of style was a guide. Writer and Artists Year Book was consulted. Eventually my wife, Majella intervened and bought me a small dedicated word-processor / typewriter. Paid a professional proof reader but relied also on family. Hang-ups there plenty. Writing about a divided community as a member of that community and still living in that community. It was fraught with risk. A subsidy publisher initially published the work under the title ‘All Honourable Men’. Title implying each had their story to tell. The star crossed lovers theme offers hope. The love of two people can overcome hate and division. However I soon found the title was vying with seventeen other works of the same title. Old Mr Shakespeare was just too good. Set in the early 20th Century its message is for the 21st. The closing decades of the 20thC saw yet more sectarian strife. The hope for the 21st must be “never again. Book was written in Warrenpoint in 1989 it was published in 2018 – (prolonged writer’s block)? I lived in Warrenpoint Town centre. The book was written in the town’s Clermont Gardens Estate. We lived close to the town’s police station – too close. The station was attacked by the IRA that April. Twenty one people were injured. One young woman was killed. My wife and my unborn child Emma had a very lucky escape. This book is definitely a creature of the troubles. A story of the turbulent years of early twentieth century Ireland. A tale of divided loyalties and star-crossed lovers. From the mud of the Somme to the ruins of Dublin, the reader sees Ireland in War, revolution and Civil War. 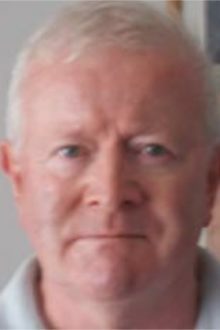 Fionnbarr O'Luain spent most of his life on the Irish border throughout the recent Irish Troubles. There was an all too short sojourn of two years in New York. There was a total of five years spent at University in Belfast - the Troubles raging relentlessly on, with at the time, little hope in sight. In Belfast the author experienced the destruction of his student lodgings on University Road -one of many close calls. 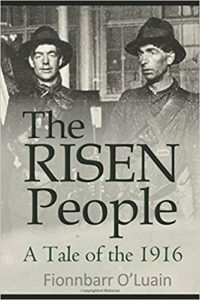 The Risen People was written in 1985 but only published in 2018 - shortly after the Centenary of the Novel's main events The Easter Rising and the Somme. The book was an attempt by the author to somehow come to terms with the fears, suspicions and passions that consumed so many of the Irish people. It was also an attempt to say 'Wait - there's two sided to every story'.